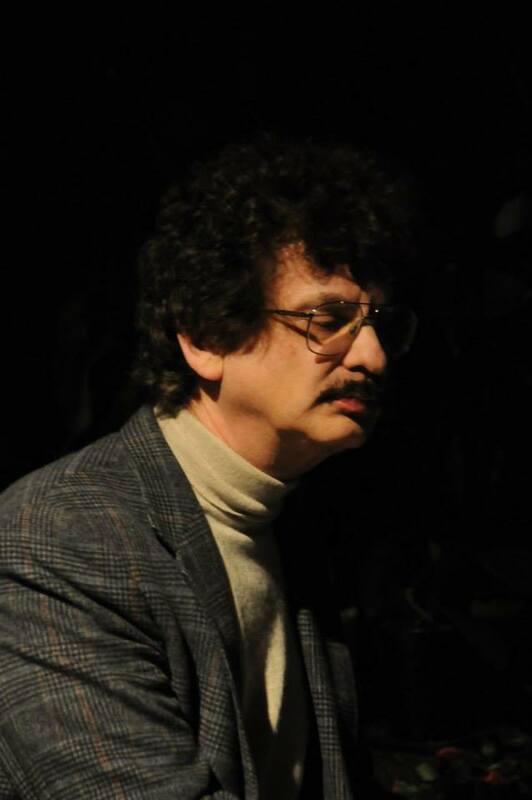 Dr. Marvin Rosen is available for performances, lecture recitals, and music history lectures for schools and various organizations. One of the oldest private Princeton Music Clubs, The Music Club of Princeton includes performing members as well as music lovers. The club meets 9 times a year at a private location around Princeton for concerts. The Club also sponsors a Scholarship fund for young performers. Visit: 1867 Sanctuary for details and tickets! "Who’s Afraid of New Music?" 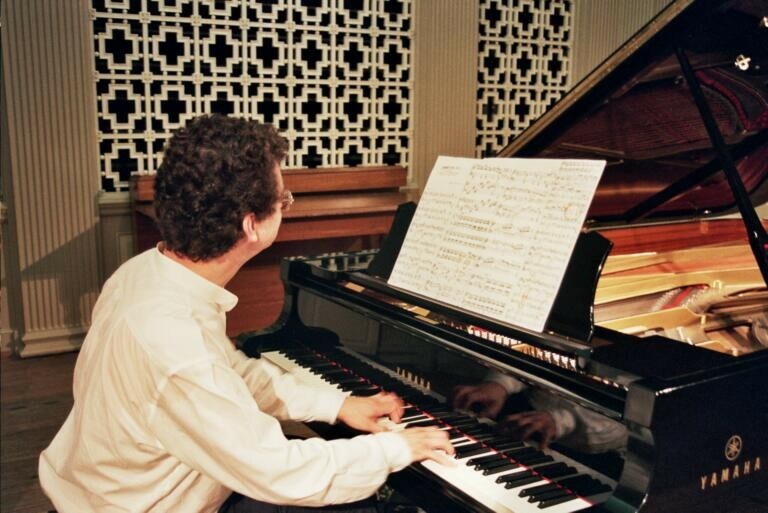 Piano music written in the 21st century from all over the world is the focus of this workshop presented by Marvin Rosen, faculty member of the Westminster Conservatory of Music and host and producer of WPRB’s “Classical Discoveries” program. A number of short complete works will be performed during the program. 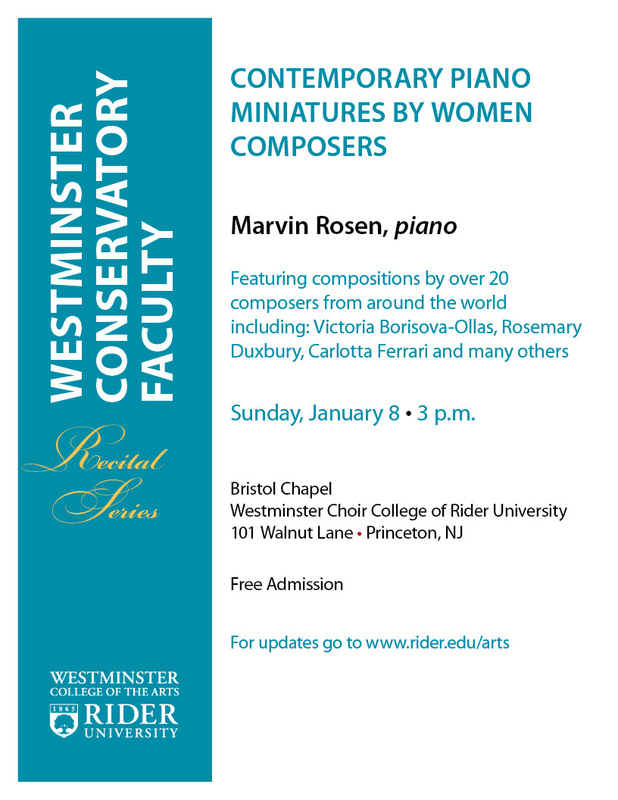 Marvin will be joined for several selections by pianist Alison Neely, director of the Honors Music Program at Westminster Conservatory in Princeton, NJ. Included will be music by Ludovico Einaudi, Ana Milosavljevic, Arvo Pärt, Jaan Rääts, Valentin Silvestrov and others. Also included will be the world premiere performance of "Waltz" for piano four-hands written for Marvin Rosen by American composer, Robert Moran. Performer and music educator Alison Neely is a resident of Princeton. She received a M.M. in Piano Performance from The Hartt School of Music and a B.A. from Wesleyan University. Her major teachers include Paul Rutman, Leonard Shure, and Sanda Schuldmann. In addition to performance of standard solo piano repertoire, her career interests have also included performances of Avant-garde vocal music, study of West African drumming, and work in Bioenergetics and Ideokinesis. Ms Neely is a master teacher on the piano faculty of Westminster Conservatory of Music. She is the Director of The Honors Music Program, Westminster's pre-college school for gifted musicians. Her vision shaped its exceptional curriculum, which develops the complete musician through training towards artistry in performance, scholarship, and improvisation. Her students include performers and professors of music and dedicated amateurs. Ms. Neely is a frequent clinician and adjudicator in the tri-state area. Formerly on the piano faculty of the Neighborhood School of Music in New Haven, she has served on the executive boards of New Jersey Music Teachers Association and Chamber Music Plus. 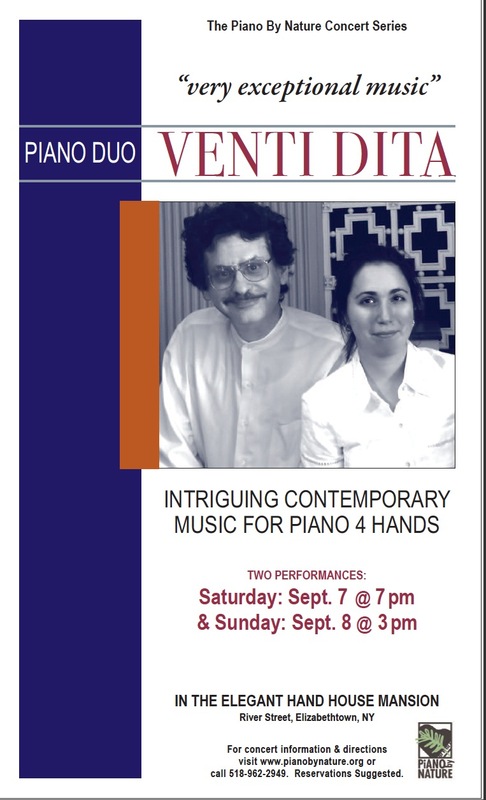 She is a new member of Piano Duo Venti Dita. WHO IS AFRAID OF NEW MUSIC? Included will be selections from the new CD as well as a couple of other works for piano 4 hands (including the recent version for piano duo of Arvo Part's Pari intervallo). The CD includes music by Norman Dello Joio, Alan Hovhaness, Franco Antonio Mirenzi, Jennifer Castellano, Urmas Sisask, Morton Feldman, Andrew Rudin and Romualds Jermaks. 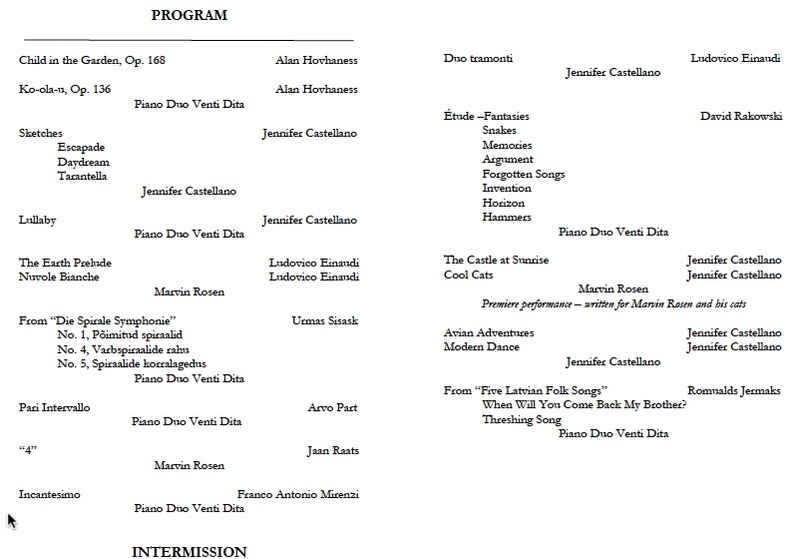 The program will also include works for solo piano by Ludovico Einaudi and Jennifer Castellano. Jennifer Castellano's piano piece Cool Cats written earlier this year for Marvin and his cats will be premiered on this concert as well. The Compact Disc will sell for $12 with 25% of the total CD sales donated to the Westminster Conservatory of Music Scholarship Fund. The Evergreen Forum is a volunteer organization under the auspices of the Princeton Senior Resource Center. All course fees go to PSRC for administrative costs, class materials and classroom space. Marvin Rosen, host of Classical Discoveries on WPRB, is back for a survey of early music to prove that there is much more to it than Vivaldi's Four Seasons and Bach's Brandenburg Concertos. In addition to music from Western European Countries, you will hear samples of reconstructed music going as far back as the time of King David, as well as works of women composers, music from the Turkish Court, Sephardic songs, and much more. An open mind, with a desire to hear a varied repertoire, is all that is required. There are no prerequisites, weekly assignments or required reading. Of course, you will be given enough resources to further explore on your own if you so desire. 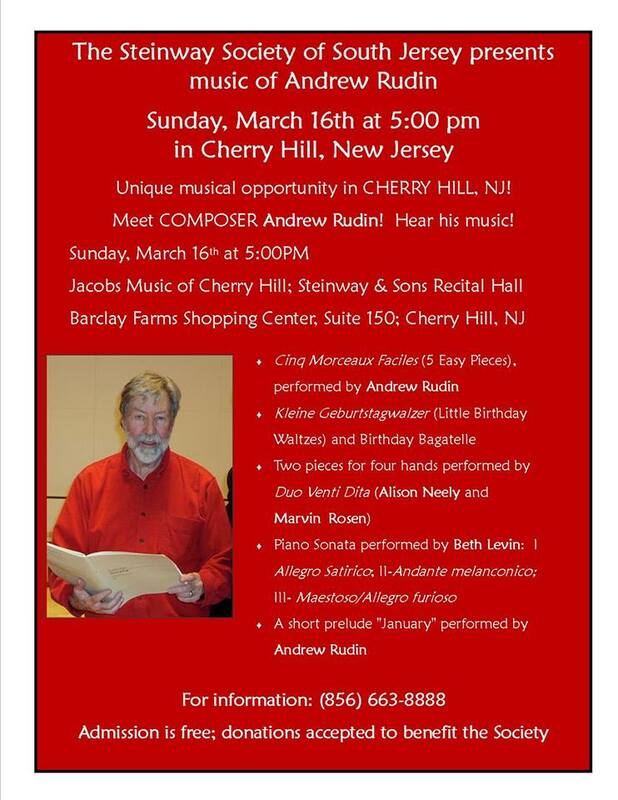 Marvin Rosen will be presenting workshops featuring 21st Century Piano Repertoire together with this year’s commissioned composer for “New Jersey Music Teachers Association (NJMTA), Jennifer Castellano. Jennifer will perform her own compositions and discuss her challenges as a visually and hearing-impaired musician. 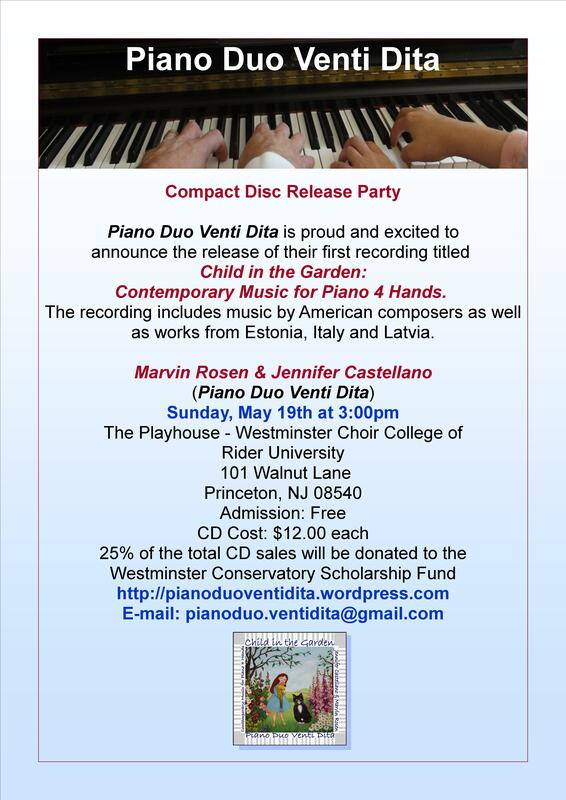 Jennifer and Marvin (Rosen - Castellano Duo) will be recording a CD of contemporary compositions for piano four-hands during the summer and will be presenting a few of these works during the upcoming workshops. The workshops will also include Marvin’s performances of new piano repertoire, which he intends to record soon. Jennifer will perform her own compositions and discuss her challenges as a visually and hearing impaired musician. Jennifer and Marvin (Rosen - Castellano Duo) will be recording a CD of contemporary compositions for piano four-hands during the summer and will be presenting a few of these works during the upcoming workshops. The workshops will also include Marvin’s performances of new piano repertoire, which he intends to record soon. This will be part of the Musical Styles class Marvin Rosen teaches for the Piano Pedagogy Certification Program coordinated by Lillian Livingston. at Jacobs Music, 2540 Brunswick Pike, Lawrenceville, NJ 08648, 609-434-0222. This lecture recital will focus on late elementary, intermediate and early advanced piano repertoire from all over the world. There will be music from such countries as Australia, Estonia, Iceland, Latvia, New Zealand, Japan, Slovakia, the USA and many others. I am hopeful that this lecture recital will prove that there is a tremendous amount of new, exciting material for teachers to share with their students. 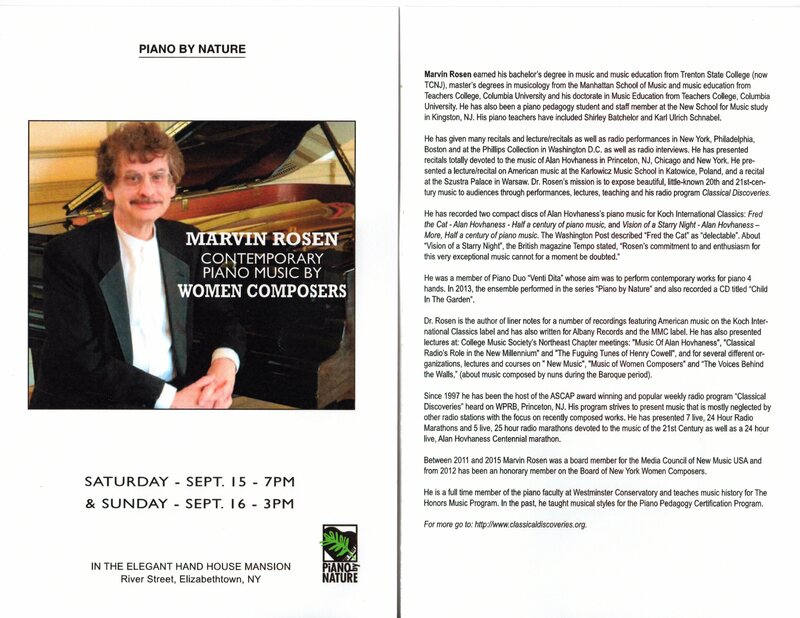 To commemorate the 100th-year anniversary of Alan Hovhaness' birth, Marvin Rosen will perform many of the composers solo piano works, plus 3 piano duets. 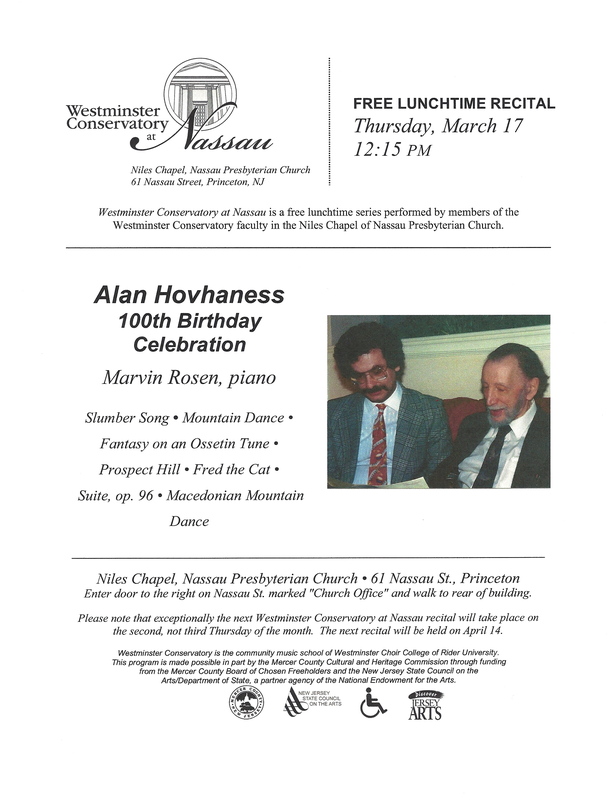 Performance by pianist Marvin Rosen features the works of Alan Hovhaness in celebration of the 100th anniversary of his birth. 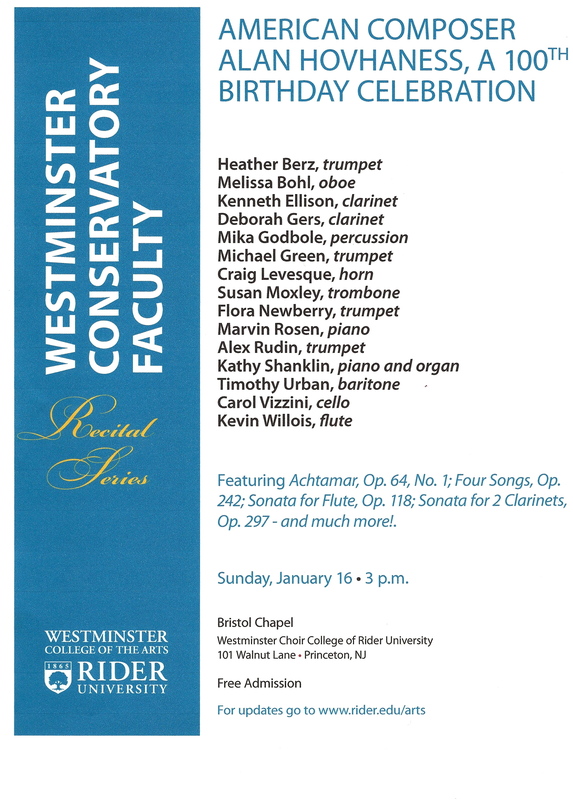 Half-hour lunchtime performances presented by faculty from Westminster Conservatory, the community music school of Rider University's Westminster College of the Arts. Included will be solo works by Alan Hovhaness from 7 different decades plus 2 piano duets. 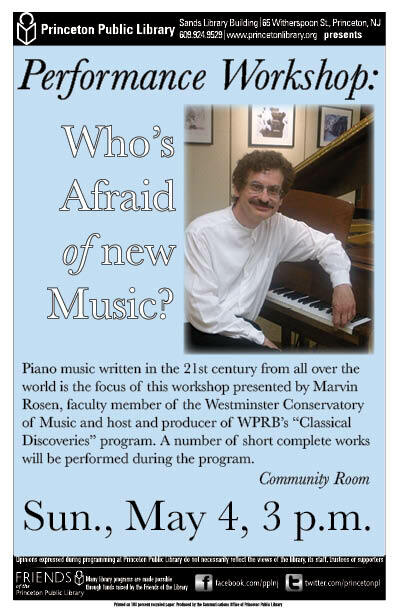 Marvin will be joined by guest artist Jennifer Castellano in the piano duos. 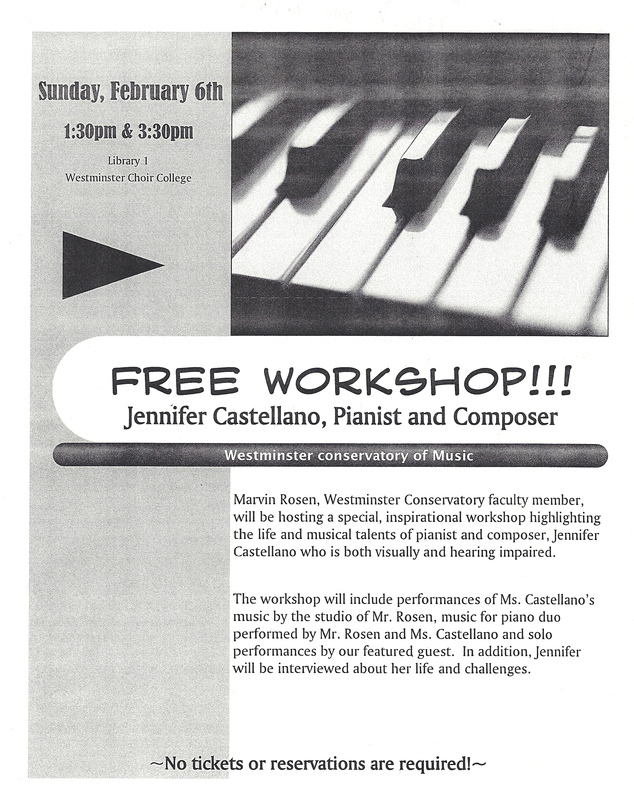 This inspirational workshop will include performances of Ms. Castellano’s music by the studio of Marvin Rosen, music for piano duo performed by Marvin Rosen and Jennifer Castellano, and solo performances by our featured guest who is both visually and hearing impaired. In addition, Jennifer will be interviewed about her life and challenges. Featuring a range of works by the distinguished American composer, Alan Hovhaness (born March 8, 1911), one of the most prolific composers of all time. One of the oldest private Princeton Music Clubs, The Music Club of Princeton includes performing members as well as music lovers. The club meets 9 times a year at a private location around Princeton for concerts. Club also sponsors a Scholarship fund for young performers. at 61 Nassau Street in Princeton, NJ. Marvin will present music by: Urmas Sisask, Raimo Kangro, Jaan Raats and others. 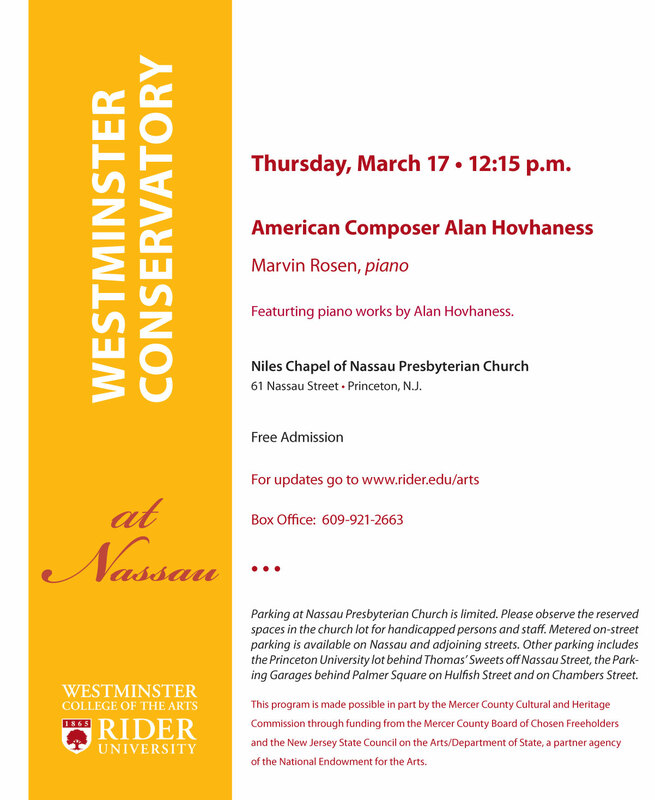 Westminster Conservatory at Nassau recitals are held on the third Thursday of the month, September to May (except December) at 12:15 p.m. in the Niles Chapel of Nassau Presbyterian Church at 61 Nassau Street in Princeton. 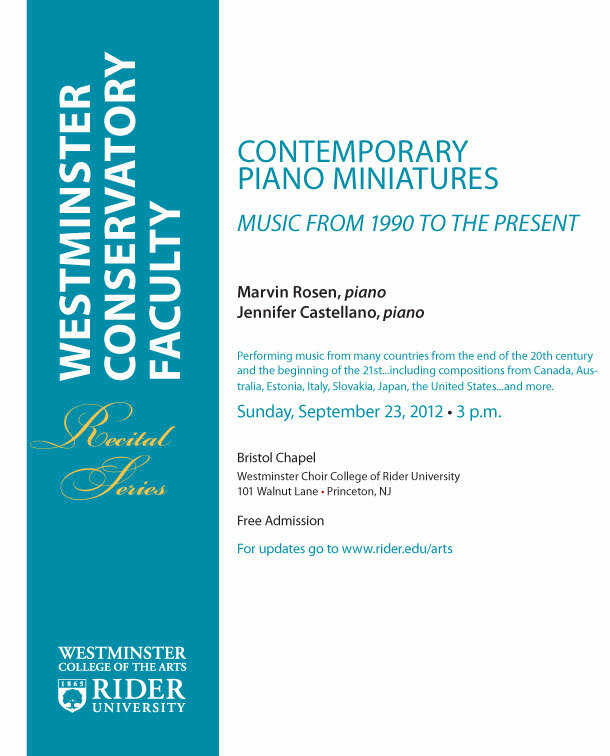 These half-hour lunchtime recitals feature performances by Westminster Conservatory faculty members. Free admission. This course focus on American music from its earliest years through the present day. Included will be many listening examples by not just the well-known figures of American music such as Aaron Copland, Charles Ives and Leonard Bernstein for example, but by the lesser known figures as well. 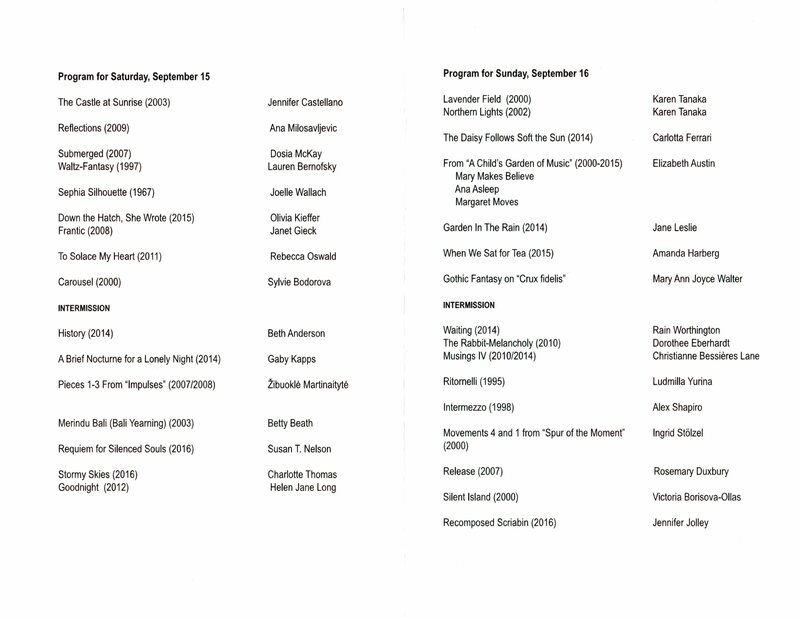 Following the first introductory week, each class will focus on works composed during a specific time period, with the final class being totally devoted to music of the 21st century. A large variety of music will be presented during each class as well as a listening list. An open mind, with a desire to hear a large variety of repertoire, is all that is required. There are no prerequisites, weekly assignments or required reading. Of course, you will be given enough resources to further explore on your own if you so desire. Meadow Lakes Retirement Community at East Windsor, NJ. Caterina Assandra, Chiara Margarita Cozzolani, Sulpitia Cesis, Isabella Leonarda, and Lucrezia Orsina Vizzana, are only a few names of nuns that lived and composed music all their life behind the walls of the Italian Cloisters during the Baroque Period. Often in defiance of orders from their male superiors they wrote high quality music that is becoming better known in recent years. This is thanks to a number of excellent recordings as well as to a heightened awareness of women's contributions to musical life through the centuries. 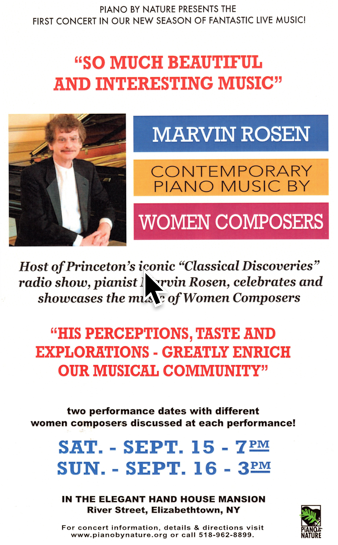 Dr. Marvin Rosen teaches piano and Music History at Westminster Conservatory in Princeton and is also host of the popular ASCAP award winning radio program “Classical Discoveries” heard on WPRB, 103.3FM in Princeton. 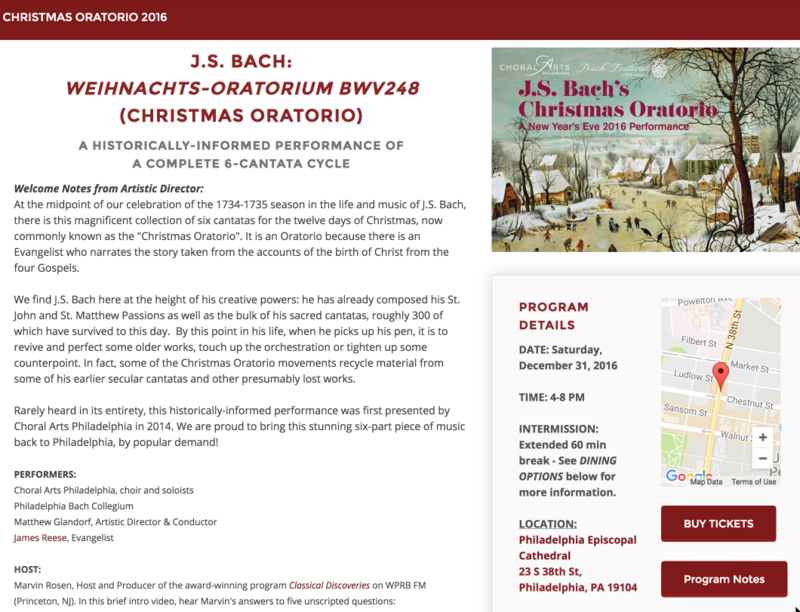 As a big supporter of women composers, he will be talking about one of his favorite subject – music of the Italian nuns of the Baroque, their lives, works and obstacles that they encountered. Also included will be audio samples of their incredible and glorious music. A list of resources will be provided for those that wish to explore this subject further. Marvin will be performing and discussing recent works from many countries including for example: Australia, Belgium, Estonia, Iceland, New Zealand, Slovakia, United States and Ukraine. Included will be selections composed especially for the performer..